David P. Soares, born 1952, has been keeping tropical fish for about thirty years now. For the last 12 or so he has been keeping the Dwarfs from South America and Africa exclusively. 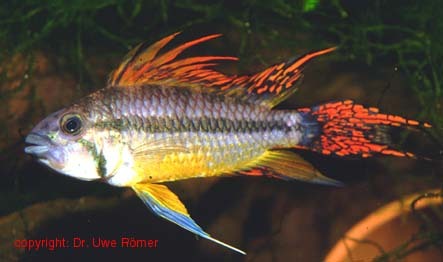 He is the active have of Soft Water Dwarf Cichlids hatchery in the US. This is the half that does the keeping and breeding. The other half is the “new species collector” and brain. In the last twelve years David has been keeping these little guys he has managed to spawn about 40 different species of Apistogramma. David always wanted to build a large hatchery and when he moved into his current residence in Sisters, Oregon, he had the chance to realize his dream. So he converted his garage into a 900 sq. foot hatchery. When he hooked up with Uwe he also acquired a purpose for the hatchery, and at that moment Soft Water Dwarf Cichlids was born. Several publications were the product of their cooparation too.